The NFL is back. Are you? Can the NFL recover from its ratings slump? Football is back. The NFL hopes you are, too. Last year the league had its hands full with decreased ratings, national anthem protests, domestic violence cases and fears about concussions. The 10% ratings slump seemed to quantify the myriad problems facing the NFL. Some people even wondered whether it was the beginning of the end for the powerhouse league. It was a shock for a league that has long been a juggernaut. But the speculation and doomsday projections turned out to be just that. The NFL is back on course. Eric Shanks, president and chief operating officer of Fox Sports, said that "everybody bounced back" after the election and during the postseason. And the NFL continues to win the battle for live viewers, even in the face of viewers' increased aversion to watching TV programming when it airs. NBC averaged more than 20 million viewers last year for its "Sunday Night Football" game. Still, what happened last year was a wakeup call. Despite its strength, the league faces challenges as the 2017 season kicks off. To speed up games and keep viewers engaged, the NFL is considering a play clock after extra points and touchdowns and will limit overtime periods to 10 minutes instead of 15. It's also trying to change how it structures commercials so there are fewer breaks in the action. Fox Sports will use six-second commercials to shorten advertising breaks. Shanks said the league has also made the early-season games more entertaining. They "really built a great first-half schedule," he said. To kick off the season, the reigning Super Bowl champion Patriots face the Kansas City Chiefs on Thursday night in a game that pits two powerful offenses against each other. And in the first "Sunday Night Football" game the New York Giants take on the Dallas Cowboys, a.k.a. "America's Team," in one of the most riveting division rivalries. 49ers quarterback Colin Kaepernick began taking a knee during the national anthem last year to protest the treatment of black Americans, especially by police. Kaepernick's passive gesture was blamed for the rating decline, but a J.D. Power study of more than 9,200 fans showed that only 3% of viewers who tuned out cited those protests as a reason. Still, it had an impact. "It is something they don't find attractive or they don't find compelling in coverage of the football game, "CBS Sports Chairman Sean McManus said at a media event, citing internal research. But he emphasized the it was not the main reason people stopped watching. Kaepernick remains unsigned, and many think he's being punished for speaking out. Look for this to be an ongoing storyline in 2017. More players are already joining the anthem protests. The NFL's handling of domestic violence also turned away some fans. In 2014, Ray Rice was suspended only two games after video showed him dragging his fiancee's body out of an elevator. The backlash led the league to toughen its domestic violence policy. But the NFL is still figuring out how to handle the issue of domestic violence. This season, the league was criticized for taking too long to suspend Cowboys running back Ezekiel Elliott for domestic violence accusations. But others said the punishment was too harsh because he hasn't been charged with a crime. Looming over all this is increased awareness and concern about concussions, which may be the closest thing the NFL has to an existential threat. A recent study published in the Journal of the American Medical Association found chronic traumatic encephalopathy, or CTE, in 99% of deceased NFL players' brains that were donated to scientific research. Last September, the NFL announced a $100 million concussion initiative aimed at making the game safer. Of that $60 million will go to tech innovation and $40 million will go to medical research. But there's enough concern that parents are keeping their kids out of football -- participation from 2010 to 2012 was down 9.5%, according to a 2013 study by ESPN. 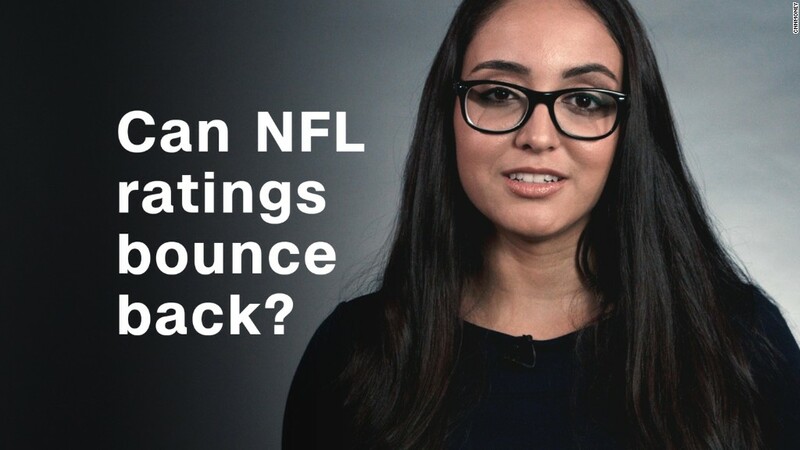 Elizabeth Lindsey of the marketing agency Wasserman told CNNMoney that charged issues like concussions, protests and domestic violence can't be overlooked, but the NFL is aware of them and trying to address them. "But you have to allow them time to clean up their house," Wasserman said. "These issues are getting discussed every day on Park Avenue." Lindsey said as long as the league doesn't ignore its problems, it will continue to attract fans and advertisers. If ratings keep falling, ad dollars will follow, but that hasn't happened yet. "It's not like people are taking ad money out of the NFL and putting it in baking shows," she said. "They're putting it in streaming deals and social." The NFL told CNNMoney that it's confident it's still "the most valuable property in the sports and entertainment industry." The NFL credited its success to its "relentless focus on making the game both competitive and engaging for our fans." The NFL has embraced social media and forged deals with Twitter and Amazon to stream games. Lindsey said the league's focus on international markets -- four games this season will be played outside the United States -- is another sign of its ability to adapt and innovate. "If you run any business, you constantly have to keep an eye on 'Who are our fans? Who are our fans of tomorrow? How are they consuming?'" Lindsey said. "The NFL is doing that. They're not doomed because they're adapting. They're smart businesspeople." Correction: An earlier version of this article incorrectly reported that $40 million from the concussion initiative had already been made available.